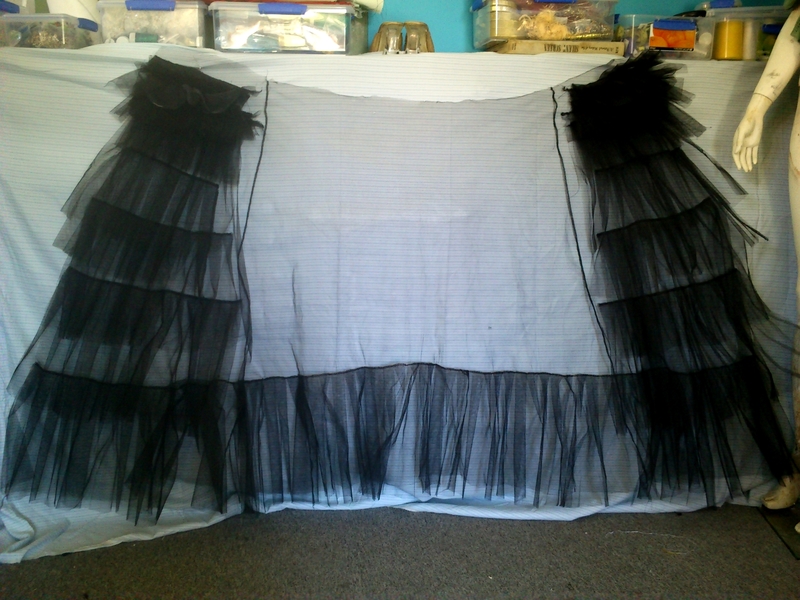 I took the original apart and made an extra layer so there are four all up with ruffles on each. 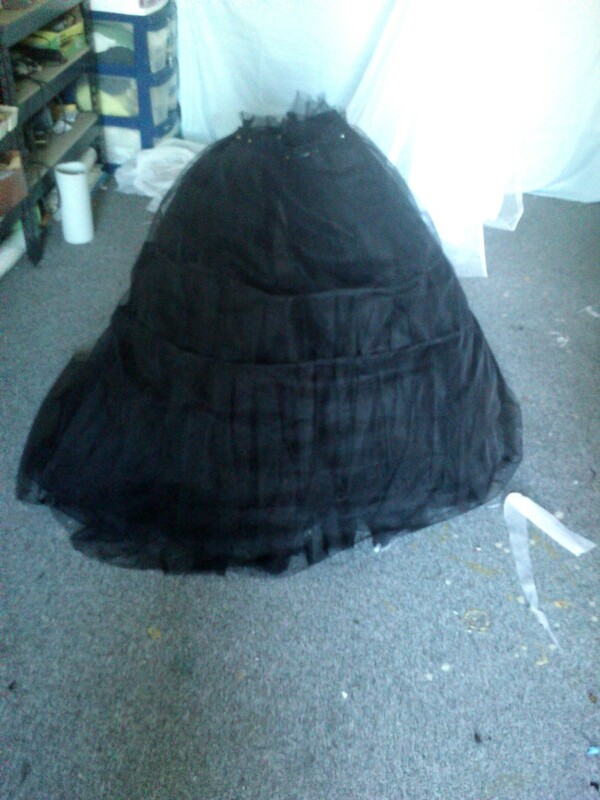 Put face to face so that all the ruffles are inside rather than directly under the taffeta skirt or against my legs. And it stands up by itself.. 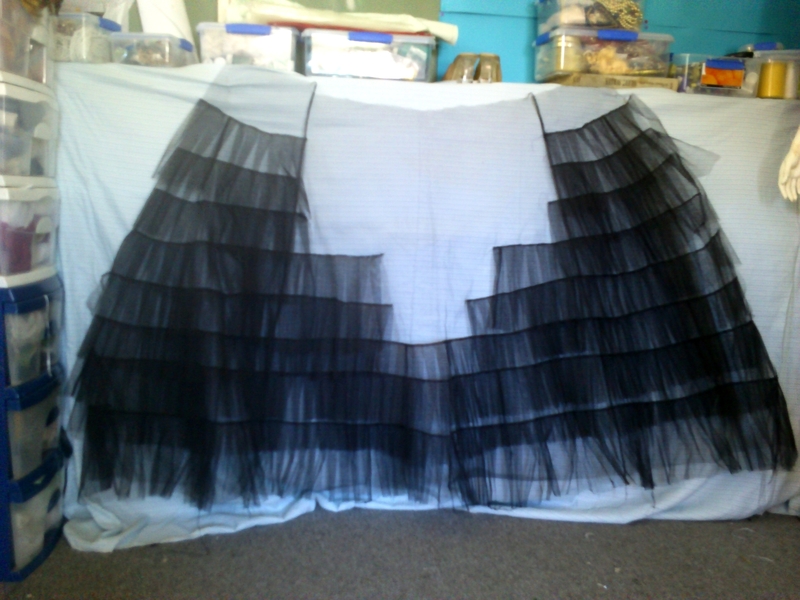 The ruffles are super dense at the top to create a bit of a bustle. 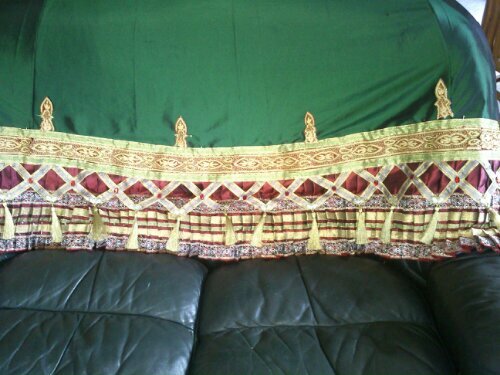 Author m d bPosted on 2014-02-01 2017-04-16 Categories UncategorizedTags cosplay, daae, elissa, featured, hannibal, phantom of the operaLeave a comment on Elissa net skirt! 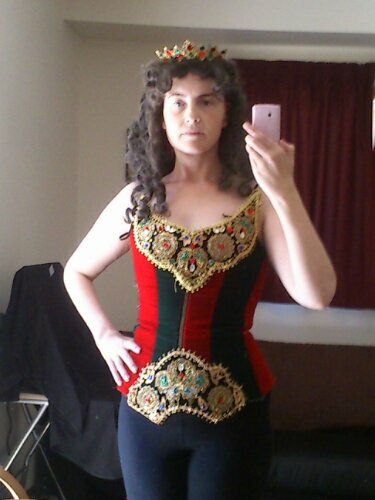 Test fit, the zip is pretty rigid but I do need boning. 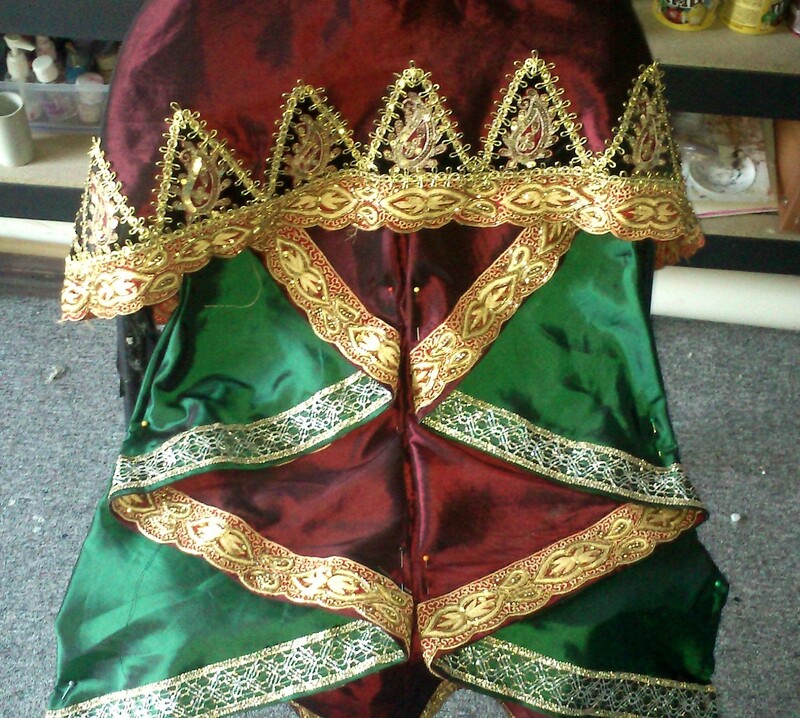 I may top stitch the seam allowances first then put in boning cases and trim. I will indeed do lacing up the back as I am loving this front zip business! I had an invisible zip in my first version but this chunky metal zip will last forever! Frizzy wig!!!!! 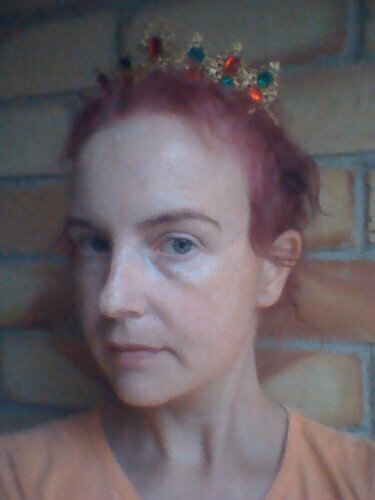 Sorry for the fuchsia hair peeking out I will use a spray to tone that back. 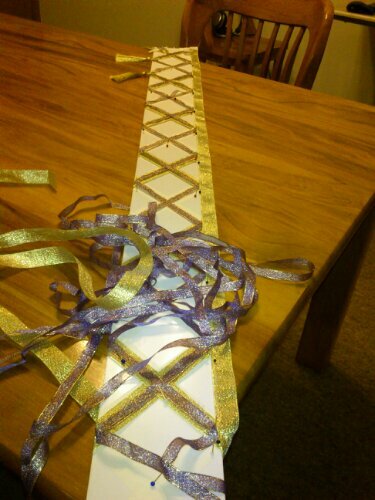 So ribbon on ribbon over applique under ribbon on ribbon. Next and maybe possibly last thing to do on them is to add more loopy braid which is all over the other elements. 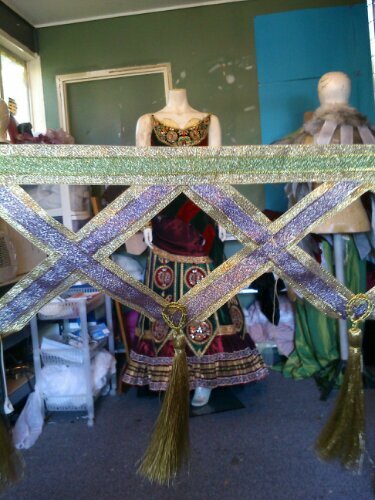 I would be tmpted to sew rows and rows of ribbon over the shot green taffeta to be closer to the Aussie version but the tabs on those are super wide and only three at the front, so…… No. Keeping the Hamburg vibe here with the heavy reliance on green red and gold only. 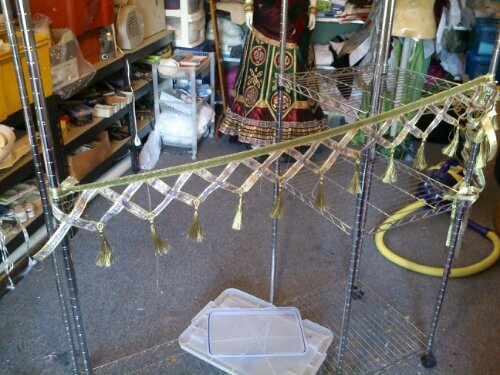 And the wee arrow heads will get ironed on and probably edged in more loopy braid. 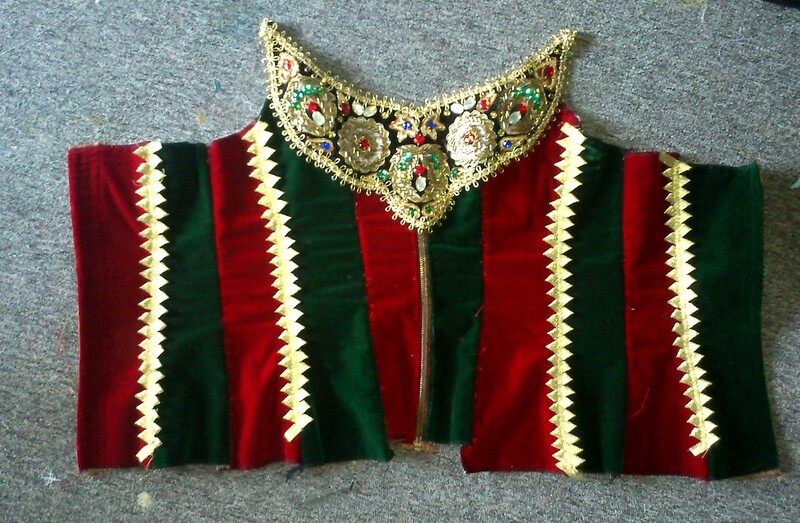 So this is going to be weird- I did have a big break before doing the jewels and pinning to the skirt. 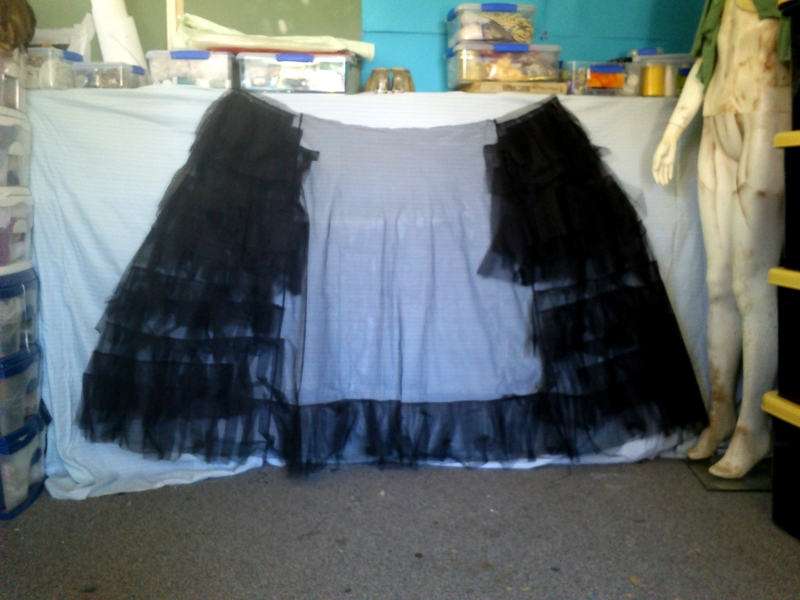 Now I will need to press the pleats again before sewing. 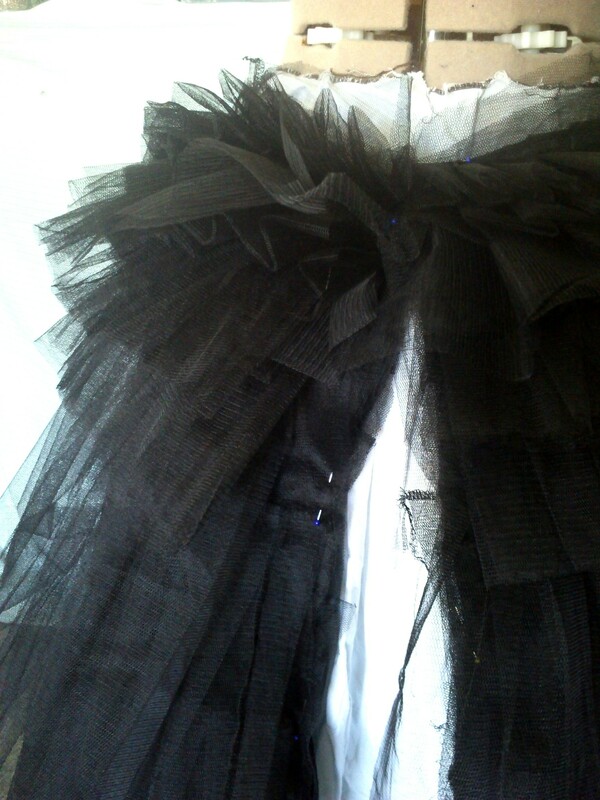 Possibly will machine the pleats at the upper most row of ribbons. 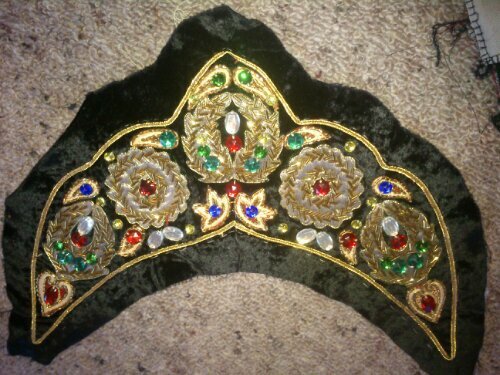 And then I still need to work out how far apart to do the appliques on the skirt between the tabs. 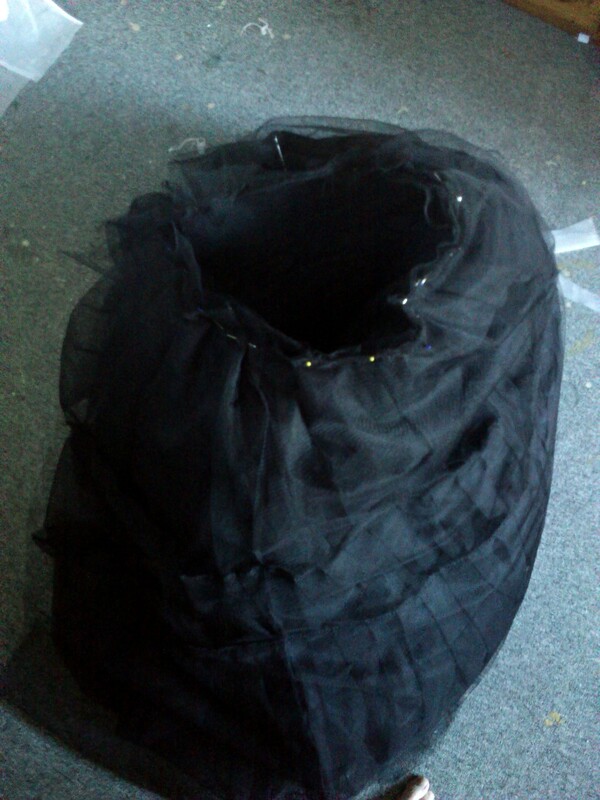 Before mountng it all on the net under skirt and sewing the heavy tabs in place. 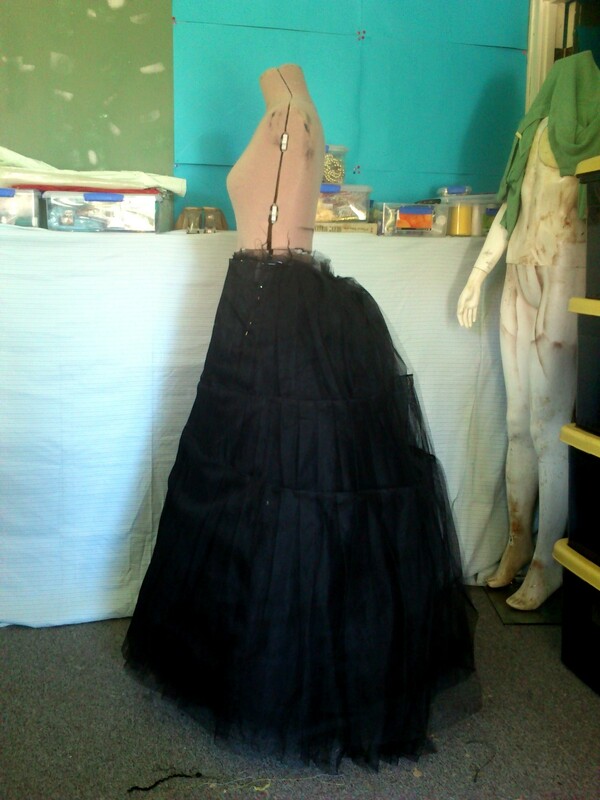 Then the drapery and the huge snaps down the back and freacking huge fence hook at the waist and hiding it all with the faux bodice. 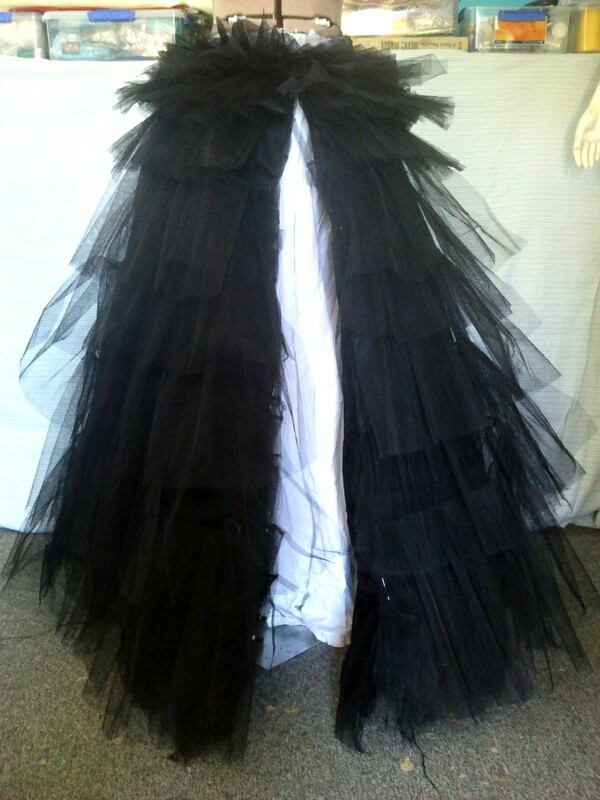 But man that trellice so makes the hem. It just makes it so Phantom. 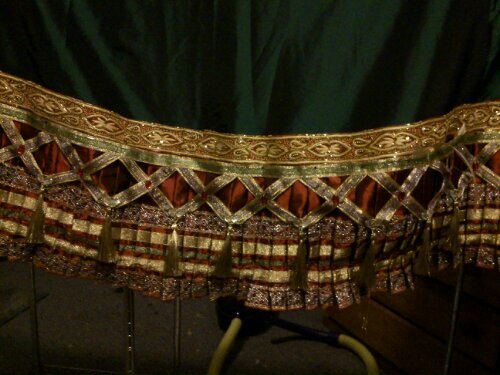 Had to be hand sewn, both the shape (open lattice) and the shine (gold thread shreds as it is) made machining just all terribad. 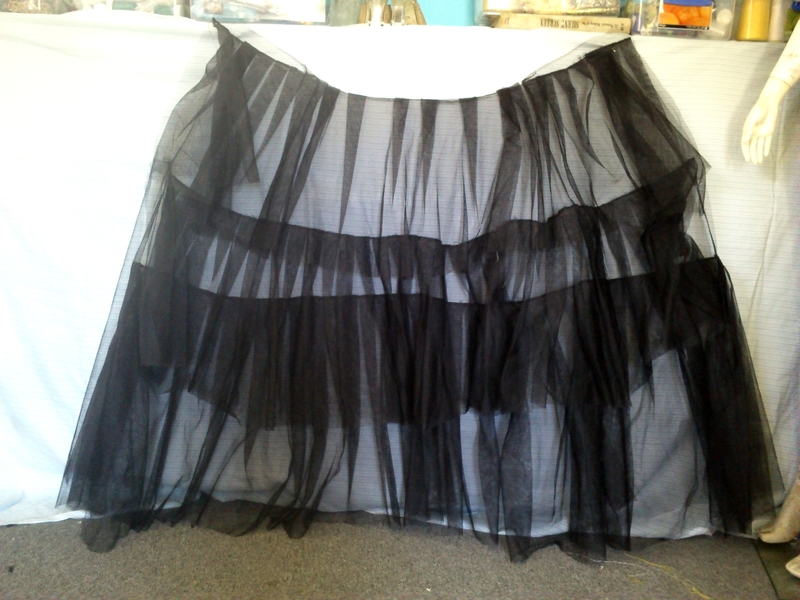 Now I need to take a big break, like for a day, and then the gems go on and I start pinning it to the top of the pleated hem and hand sew to that. I see a lot of pinning to avoid tears. Sigh, this is awkward so it’s being left for a while. I may put some more bits on later. Author m d bPosted on 2013-12-29 2017-04-16 Categories UncategorizedTags daae, hannibal, phantom of the operaLeave a comment on Princess!! It just got put on our mini tree, and yep it’s like a tree ornament! Actually finished, those are sewn down. 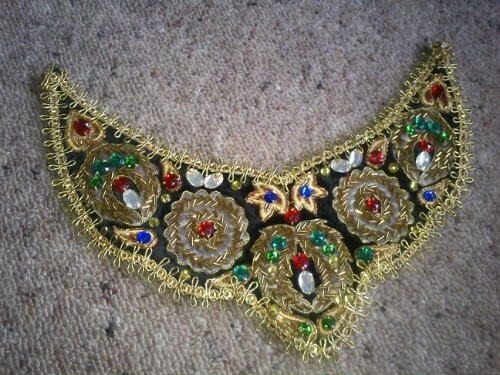 Author m d bPosted on 2013-12-25 2017-04-16 Categories UncategorizedTags daae, elissa, phantom of the opera, think of meLeave a comment on Elissa chest piece, zomg!